When Micah Lau walked onto the Hawaii football team two years ago, he had the same big dreams every non-scholarship player does. But Lau, a practical, unassuming sort, considered them just that. Dreams. This year they came true. When: Dec. 24, 3 p.m. 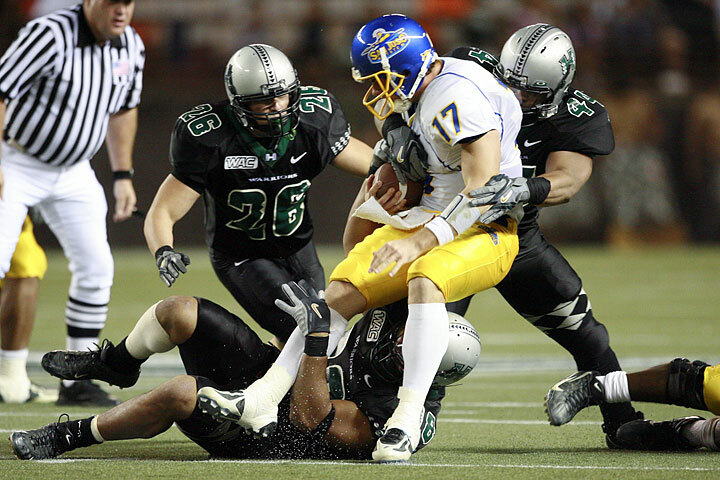 The undersized overachiever from Kamehameha earned a scholarship as a scout-team grinder and special-teams stud in 2005. This fall he worked his way into the Warriors' starting lineup as a 5-foot-9, 215-pound outside linebacker six games into the season. And there he still is heading into the Dec. 24 Sheraton Hawaii Bowl, atop the depth chart above several other players with more natural talent. "I always had thoughts (about starting), but I never thought this would happen," Lau said after yesterday afternoon's practice. "It's been a great experience this year, being able to play a lot. It's been a pleasure playing with all these guys, because if it wasn't for them, I don't think I'd be in there." Lau's stats aren't super impressive; he has 21 tackles, including 1.5 for loss and a fumble recovery. But his attention to alignment and assignment prevents big offensive plays and allows other defenders to make the hits. Freshman Blaze Soares has been getting more playing time in recent games, but Lau remains the starter. "He plays hard and he's been accountable," UH coach June Jones said. "He completes his assignments and he's given us all he has. He's played well." Outside linebackers coach George Lumpkin said Lau's work in the weight room allows him to play bigger than he is. "He's always been a good player, a smart player. Tough guy. With his size, sometimes people think he's going to be overwhelmed, but he doesn't. He does his job and he does it well," Lumpkin said. "He's physical for a small guy and he's smart and he does things right. We thought we'd put him in there and see what he could do because he was always doing things right in practice." In his first start, on the road at Fresno State, Lau made a huge play early in UH's 68-37 victory. He stuffed Dwayne Wright, the Bulldogs' star running back, for a 9-yard loss on a screen pass. Although Fresno State scored on that drive, Lau's play helped set the tone for the defense in one of Hawaii's biggest wins of its 10-3 regular season. Lau would like nothing better than to make another big play and help send his senior teammates out with a victory in their final game. "I wanted to win every game for the seniors. Not just this one or the last one, every one. Every game we play, just go out hard and play my heart out because I know they're playing their hearts out too," he said. The Pac-10's Arizona State (7-5) will be the Warriors' third-straight opponent from a BCS conference. "It's always exciting to play a big team, way more exciting than playing a WAC team," Lau said. "It lets us look at ourselves as the underdog." Lau will shoulder at least some of the responsibility of containing ASU second-team All-America tight end Zach Miller. "Technique is probably the thing that helps me against a 6-7, 6-8 tight end. My height isn't going to help me. My weight isn't going to help me, so I have to rely on technique," Lau said. "It's just another player." Senior cornerback Kenny Patton participated in conditioning drills yesterday and was scheduled to undergo an X-ray today. Patton broke his collarbone in the Fresno State game. He hopes to at least suit up for the Hawaii Bowl. ... Defensive coordinator Jerry Glanville was expected to return today after some time off following the end of the regular season. ... Quarterbacks coach Dan Morrison missed practice yesterday with an aching back. ... The Warriors practiced on the soccer field because the regular football practice field is being fertilized.